'Moon Dust' OGB ( Henry Danielson, R. 1974). Seedling 73-1. AB, height 24" (61 cm), Midseason bloom. Brown to tan with darker spots on both standards and falls; large reddish black signal; bronze beard. ( 'Jallah Effendi' x 'Kalifa Baltis') X ( 'Rojo Grande' x 'Ib-Mac'). Mount Clare Iris Gardens, 1975. Honorable Mention 1976. From AIS Bulletin #216 January 1975 Introducing MOON DUST. Arilbred, 24", E-M. Sdlg. 73-1. The basic color is tan on both standards and falls, sprinkled with darker dots on the entire flower. Very large, onco-appearing flower on a sturdy stem that needs no staking. Very large, dark signal; brown beard. This plant is extremely pod and pollen fertile on most all arilbreds. It is an easy grower and fast increaser. Excellent for breeding work in producing large, dark signals. (Jallah Effendi x Kalifa Baltis) X (Rojo x Ib-Mac). $25.00. Mount Clare Iris Garden. 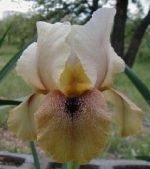 From Pleasure Iris Gardens catalog, 1984: MOON DUST--Arilbred, 24", EM, Sdlg. 73-1. The basic color is tan on both standards and falls, sprinkled with darker dots on the entire flower. Excellent for breeding work in producing large, dark signals. (Jallah Effendi x Kalifa Baltis) x (Rojo Grande x Ib-Mac). HM 1976. $3.00.